What’s that pro-abortion slogan again? Something about “caring”? In December, Women’s Medical Services in Muskegon, Michigan was forced to close its doors by the Muskegon Fire Prevention Bureau. Multiple violations were found, which led to the clinic’s closure. The abortionist, Dr. Robert Alexander, blamed pro-lifers for the violations (no, really), claiming that his clinic had always been in perfect condition. 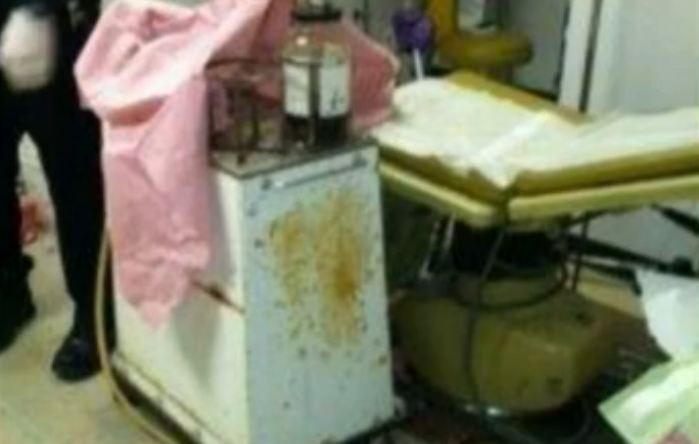 Well, local news station WOOD-TV has aired photos of the disgusting conditions at Dr. Alexander’s clinic. And if this is his idea of keeping his clinic in “perfect” condition, then it’s scary to imagine his definition of unsanitary. The photos show unsanitary conditions, including stained medical equipment near an examination chair, trash near lab equipment and discarded in a storage room, and water stains and holes in a leaky ceiling that is falling apart. The photos document a long list of violations that pose a danger to ‘human life and public welfare,’ according to city documents. And this is all somehow the fault of us rascally pro-lifers? Someone broke in and did all of this? Right. Meanwhile, the owner of the building also acknowledged that the clinic was often “messy,” and city officials confirmed that they had not been inspecting the clinic on a regular basis. Yet again, more evidence has come to light that abortionists care not a bit about the safety and welfare of the women they claim to serve.